February | 2019 | H.A.W.K.S. 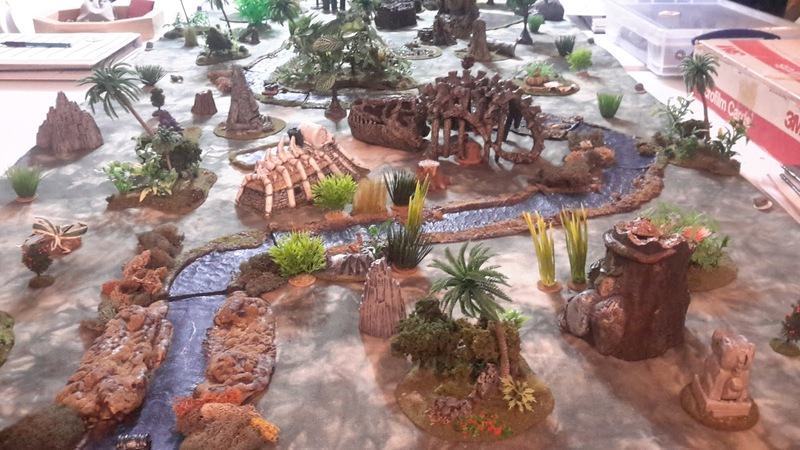 Chris Palmer This past Saturday we played the second game of our 2019 Ghost Archipelago Campaign. 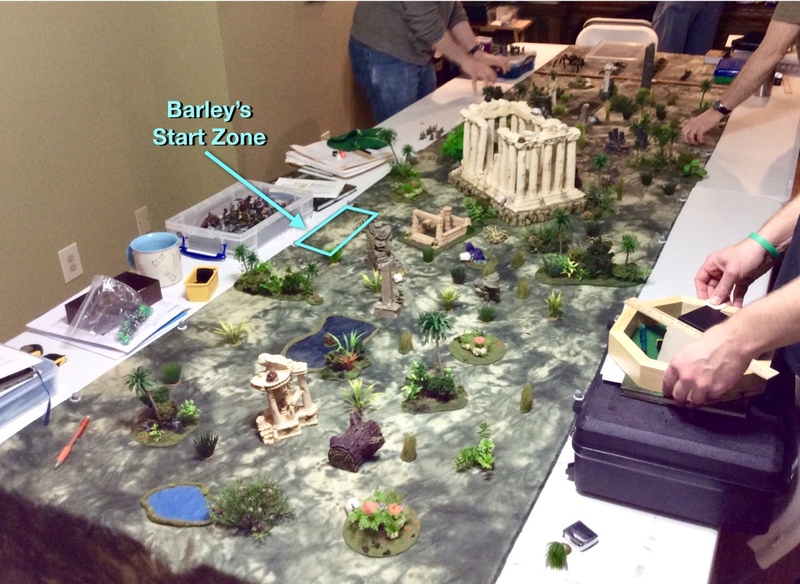 We had 7 of our 9 regular players in attendance, which meant we had 3 Central Treasures in play, spaced down the center of the 10’x3’ table so as to be equidistant from all nearby start zones. 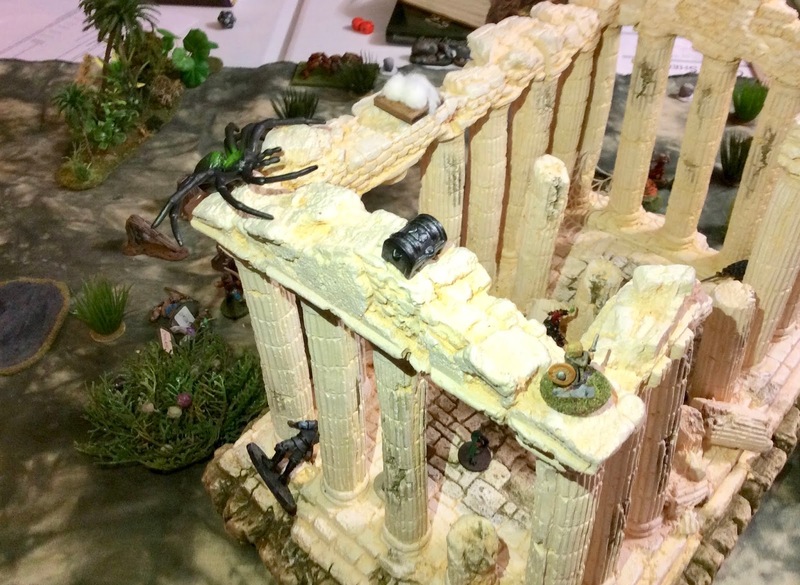 We played a scenario called “Spider Island” that was designed by one of the guys in the group. Besides the regular treasure on the table, each player placed 2 clutches of spider eggs (For a total of 14 in play (2 x 7 players =14). These eggs, from various degrees of extra-large Tree Spiders, are considered a valuable commodity in magical circles, and for each one recovered the crew got 10 Experience Points and 15 Gold Coins. We used a specialized Random Encounter table with the following results: 1-5: Roll on the regular Random Encounter table, 6-11: Tree Spider, 12-15: Large Tree Spider, 16-18: Huge Tree Spider, 19-20: Giant Tree Spider. Besides there being a chance of treasure recovery generating an encounter as normal, recovering spider eggs also had the chance to generate an encounter. I wasn’t very lucky with my set-up zone this time, drawing chip #6, and getting the second to last choice of location. This got me a spot in the center of the table on the side of the table with 4 players. Treasure wise, though, I was happy with the opportunities in front of my zone. Once all the entry zones were chosen, I found myself situated with the Heritor, Safar the Seafarer, and his Storm Warden, Willow of the Water to my diagonal front right. To my diagonal front left was the Heritor Cassilda Blackmane, and her Earth Warden, Quartz. On my direct right was the Gnome Heritor, Gnomeo, and his Beast Warden, Juliet; and on my direct left was the Heritor, Arkhan the Cruel, and his Beast Warden Tyril Tallguy. Barley Gimblehill, the Halfling and recently realized Heritor, sat on the deck of the Jolly Scallop and soaked in the sun while reveling in the simple fact that she, a simple tavern server just a few months ago, now found herself aboard a ship of the sea living a life of adventure. Her eyes, and thoughts, turned to her new friend, and Warden, Tork; who stood at the front of the ship, a seagull sitting on his arm. The Halfling girl wouldn’t have believed it a few months ago, but now, seeing the large Human Warden apparently having an intense discussion with seabird simply amused her; and the Heritor pondered what in the world the two could be talking about. Fish? After a few more minutes of back-and-forth cawing and chuttering between seabird and man, the gull flew off. Tork adjusting his sleeve where the bird had been perched, turned, and walked in his slow lumbering gait across the deck towards Barley. Barley wrinkled her brow in thought. What did they know that she didn’t? Should they go too, to check it out? Could it be a source of clues to the Crystal Pool? The Pool itself? In a flash Barley jumped up. “Come on Tork! We won’t be left out of this adventure. Let’s follow and see what’s to be found." And the little Heritor trotted away on her large Halfling feet to prepare and alert the ship’s Captain and the Crew. Tork stood slowly. Bewildered by the small Halfling’s speed. We watched her make her way down the deck, and disappear inside the door in the quarterdeck. As if an after thought, he said to no one in particular as he stared at where the Heritor had passed through the door, "Danger. Bird say Danger. Big spiders. I don’t like spiders." And he shrugged, and followed after the little Heritor. Initial Crew arrangement in their starting zone. I few hours later, Barley, Tork, and a small landing party stood on the sandy beach of the island. As the Warden’s seagull had reported, they had found a number of Heritors’ ships en route to this island, and they tagged along just out of view of the rest. The landing party made their way inland, and it didn’t take long for them to notice the exceptional quantity, and size, of webs in the trees and woven across the paths. Barley cast a questioning eye at Tork, who said simply "Spiders. Big Spiders. Don’t like Spiders." The Halfling Heritor frowned, but they were here now; and unlike her Warden, she wasn’t naturally afraid of spiders. After all, how big could they be? She had killed any number of them in the tavern storeroom. As they progressed, the party could begin to see ancient ruins, crumbling and vine covered, alongside the path in the jungle. Then the towering top of what looked like an old temple came into view above the trees. Barley halted the crew and assigned commands before they went any further. She knew there were other Heritors about, so warned everyone to be cautious. The little Halfling instructed Perkin, her Scout, as well as Lily, the Crossbow-woman, and Crewman Link Smitter to stick with her. And she told the Half-Halfling Archer Billy Wizzit, as well as the Crewmen Corel Bink, and Fernando (who was new to this party; replacing the badly wounded Archer, Jikam Wizzit, Billy’s brother.) to go with Tork. Fernando was the only Halfling she had ever seen with a mustache! Billy tormented him that he must have Human blood in his family tree somewhere. But the mustachioed crewman insisted he was just an exceptional Halfling. The Crew-folk, Ginsink Damum, and Habby Wilkersnit were left to their own initiative to help out where needed. As they continued through the web-draped jungle, the large temple came fully into view on their front left. The party could see large webs crisscrossed between its decaying columns. Beside it sat a low structure that looked like some kind of ceremonial pool. Directly to their front, Barley could see the remains of a high wall made from huge stone blocks. If she leaned a little to the left, she could see that on the other side of the wall there appeared to be a large stone face…some deity perhaps… silky webbing covered it like a veil. On their right was a large obelisk, its top long crumbled and gone. 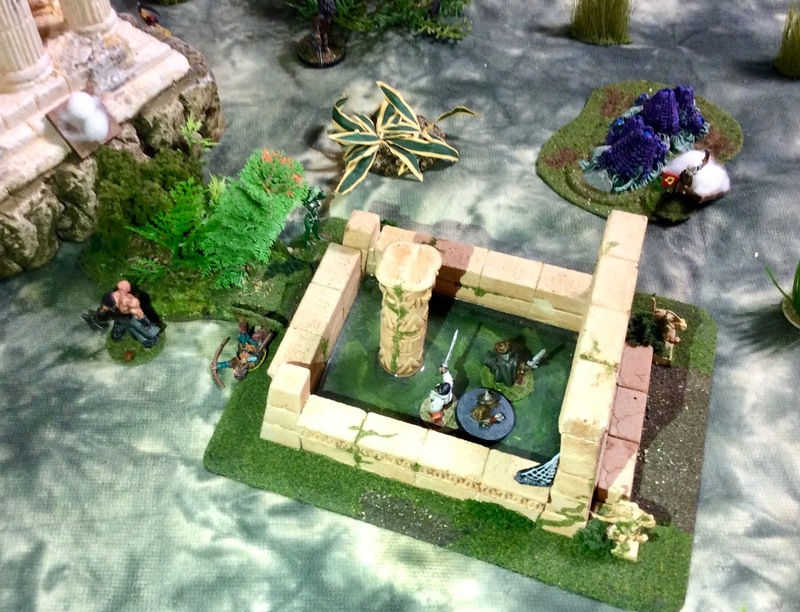 The Halfling Heritor did a double take, as there at the base of the obelisk there appeared to be a large sword stuck partway, directly into the stonework. It’s bright blade gleaming in the afternoon sun. Barley, Perkin, and Lily run to the high wall with the effigy on the other side, and spot the sword (Central Treasure) in the nearby obelisk. On their left, Link has started climbing the wall. Barley turned to her crew. She instructed Tork to take his party over to investigate the temple, and to check the ceremonial pool as they went. The Heritor then beckoned to her trio of followers and they headed at a run towards the near side of the high wall with the effigy. Barley motioned to Link, "Climb up there,” as she pointed up the wall, “and check out our surroundings. Let me know if you see any other crews or any of the big spiders Tork mentioned." Turning her attention back to the obelisk, just a couple dozen yards away, she noticed a large pond just past it, and beyond the pond: movement. Looking closer the Halfling Heritor could make out members of a Human Crew approaching (Safar the Seafarer and his men.) Just then Lily touched her arm, and directed her attention back and to their right; there, a group of Gnomes appeared from the jungle. They immediately recognized the members of the Heritor Gnomeo’s crew, having tangled with them only a month ago. Meanwhile, Tork had lead his group over to check the pool first. Nearing the low wall around the edge, the big Warden and Fernando peered into the murky water that remained in the bottom of the structure. It did not take them long before both noticed a small chest half sticking out of the green slime that covered the surface of the water. The Archer, Billy Wizzit, jogged past the two, and took up a position in some thick brush between the pool and the temple; he thought he saw moment on the far side. Crewman Corel, trailing behind, was totally distracted by the immense temple, and wandered awe-struck in its direction. Fernando knew it was up to him to get the treasure, and looked around for Corel to help him. Seeing the short, (even for a Halfling), Crewman had already wandered off towards the temple, the mustachioed Halfling called to Habby instead, who was was just passing by along with Ginsink. Crew-woman Ginsink continued on towards a clutch of spider eggs she had spotted in a nest by some strange purple plants not far past the pool; and Habby went to help Fernando with the chest. While the two Halflings cautiously climbed the low wall around the murky water, Tork turned to the jungle behind them in the direction from which they had approached the area, and let out a strange, long, undulating, half-humming, yell. (Casts Summon Animal.) In the distance, high in the sky, a Giant Wasp appeared and buzzed towards the Warden. Back by the high wall, Barley eyed the sword, then glanced again at the two approaching enemy Crews. She knew it was would be extremely risky, but it was now or never. Then, before the Halfling Heritor could act, unexpected events unfolded before her eyes. Across the way, the Human Heritor, Safar the Seafaraer, stepped forward towards the pond, seemingly oblivious to the Halflings by the wall He stood glaring at the crew of Gnomes defiantly. 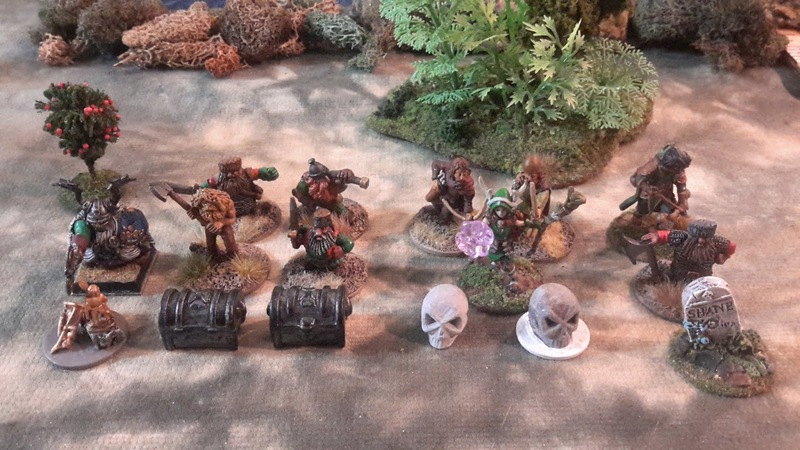 Then, several Gnome Crew, armed with Bows and a Crossbow, rushed forward towards the pond; likewise, seemingly oblivious to the small group of Halflings by the wall. With a battle cry, the small Gnomish warriors unleashed a hail of missiles at the Humans across the way, striking Safar squarely in the chest. To the shock of the Human crew, their leader collapsed to the ground. Cries of revenge bellowed from them. Barley turned to Perkin, her Scout, "Now!” she shouted; and the two Halflings raced forward and climbed the obelisk. Behind Barley and Perkin, back on the high wall, Link had finally reached the top and was surprised to find a rather expensive looking 2-handed axe laying up there; partially covered in rotting vegetation, webs, and the bones of some small mammals and birds. He could immediately tell it was finely crafted. The Halfling sailor looked around a moment puzzled as to how it might have gotten up there, totally forgetting his assignment of scouting the area. Link did take notice of Lily the Crossbow-woman, who had separated from Barley and Perkin, and was moving off to the edge of a long narrow strip of jungle to the Crewman’s right to keep an eye on the Gnomes. Lily may have been trying to keep an eye on the Gnomes, but they quickly laid eyes on her, and a crossbow bolt, and then an arrow whizzed by her. She tried to duck back a little further into the shadows of the jungle. 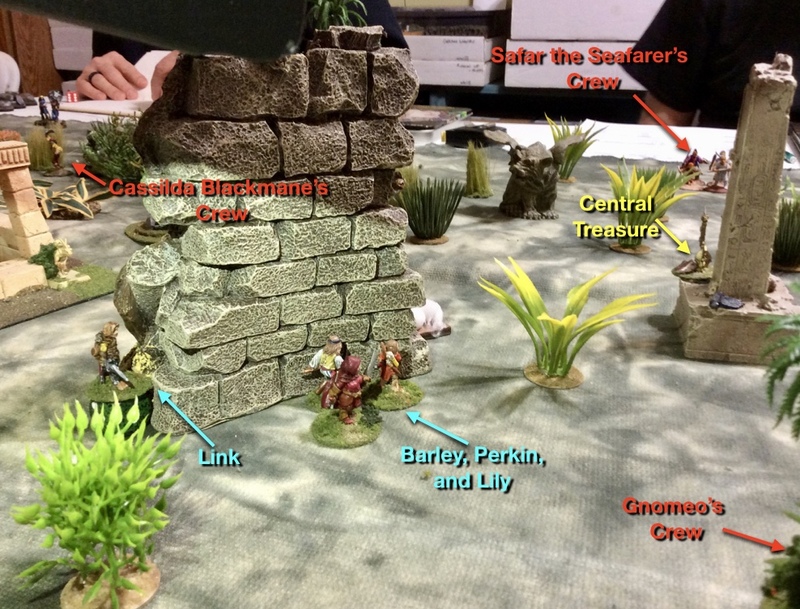 Barley and Perkin rush to the obelisk to get the sword, as Lily moves off to the corner of a patch of jungle to cover the Gnome Crew with her Crossbow. Back by the Pool, Tork saw the Giant Wasp approach in answer to his summons, and he reached out to it with his mind, forming a link with the animal. “Go help my friends.” he impressed into its thoughts. The large insect bobbed up and down in the air for a moment in reply, and then buzzed off to help the Crew. From it’s high perch, it saw the Gnomes firing at Lily, and immediately sped towards the Gnome Crossbowman. Tork then called to Billy and attempted an Envenom spell on the arrow the Archer had notched in his bow, but he had not cleared the Wasp’s thoughts fully from his mind, and he failed the casting attempt. Nearby, in the pool, Fernando laid his hands on the slimy chest, and heaved it from the water. Habby stood nearby to offer assistance if needed, and to generally keep an eye out for danger. Just past the pool, Ginsink had reached the clutch of eggs, and cut them loose from their webbed encasement and carefully stuffed them into her pack. Glancing back, she caught sight of her fellow Crewman, Corel, who had now reached the temple and had begun to climb its tall foundation. Then, suddenly from around some impenetrable brush just past the far corner of the temple, the Heritor Cassilda Blackmane appeared, tall and imposing, her jet black hair falling around her shoulders. She noticed Billy the Archer in the brush by the pool, and reacted quickly; picking up a melon sized piece of crumbled masonry from the ruined temple and hurling it with force and agility at the Archer. Before Billy Wizzit could react, the projectile hit him square in the temple sending him reeling backward, a large gash on his head (Reduced to 1 HP) The ground beneath him seemed to rock and the scenery spun. He fought for consciousness and as he did he had the vague impression of a green feminine figure rushing towards him, and then a hot pain in his shoulder, and then the world went black and the Archer fell backwards into the grass. Cassilda Blackmane’s Pearl Diver stood there for a moment making sure the Archer did not get back up, wiping her sword blade on the leaves of a nearby bush. 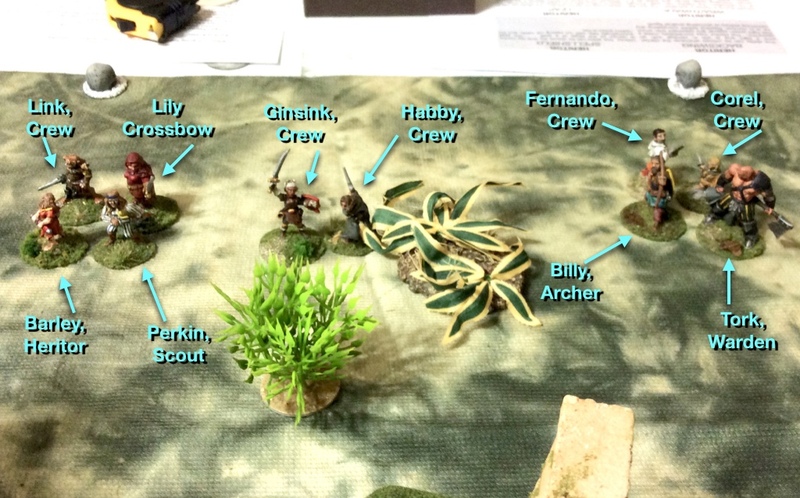 In the pool, Fernando and Habby recover the treasure, as over on the left Cassilda’s green Pearl Diver takes out Billy the Archer. Near the upper right of the photo, Ginsink recovers a clutch of eggs. Back by jungle near the Gnome Crew, Lily watched in amazement as the Giant Wasp flew by and headed directly at the Gnome Crossbowman. The Halfling shooter was unaware, that off to her left, the Gnome Heritor was drawing his own bow with the shaft pointed at her chest. Gnomeo aimed carefully, using his blood abilities to senes the wind and the track of the arrow, and compensating for any obstacles in between. Assured of the flight path of his shot (Uses Trick Shot ability. ), the Gnome released his missile. All Lily knew was a sudden sharp piercing pain in her chest, and a darkness that quickly overcame her. While the Gnome Heritor had been aiming at Lily, the Gnome Archer had been ranging his arrow at Perkin the Scout, who was standing with Barley on the Obelisk. 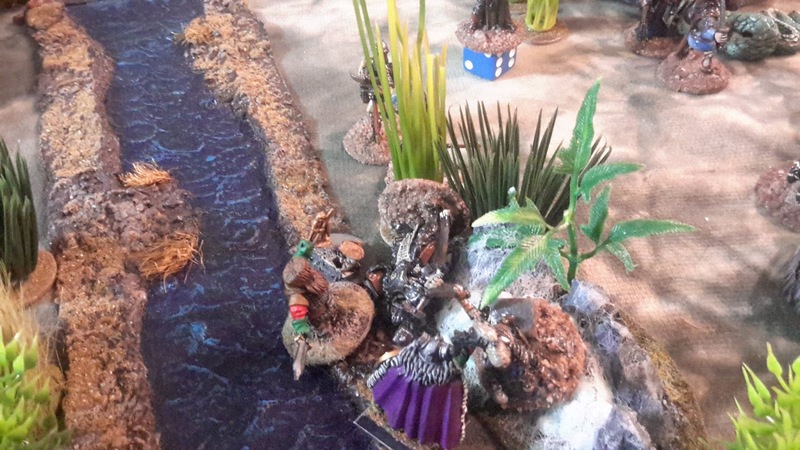 While the Halfling Heritor was mostly obscured from view, the Gnome had a clear shot at the back of the Scout. With a sharp twang of the string he released his arrow, and it struck Perkin in his right thigh. (-4 HP) He let out a gasp of pain. Seeing the shaft in his leg, Barley knew she had to act quickly. The little Heritor tugged with all her might at the blade in the stone base of the obelisk, and with burning in her blood, she managed to pull the steel blade free. Jumping down awkwardly with the long weapon, she turned and offered a hand to Perkin to help the wounded Scout climb down as well. They were mostly blocked from view now from the Gnomes and the Humans by the tall base of the obelisk, but Barley knew they were far from safe yet. The Gnomes weren’t safe yet either with Tork’s Giant Wasp in their ranks. 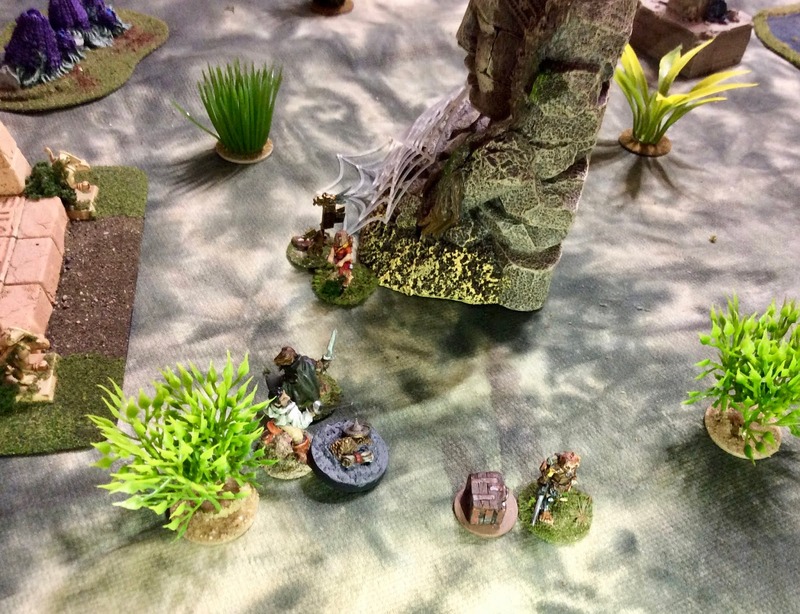 The huge insect tormented the Gnome Crossbowman (In contact, but refuses to fight), but a nearby Gnome Crewman had had enough, and charged the beast. Quickly the Wasp struck, before the attacker knew what hit him; jabbing its large stinger into the unfortunate Gnome’s chest. 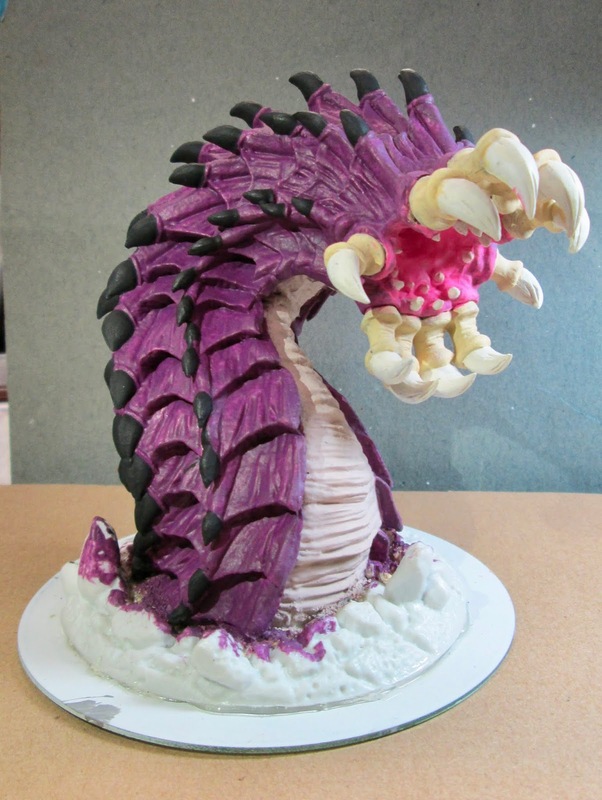 (I roll a 20 for it’s attack!) The Gnome Crewman dropped to the ground instantly dead. Over by the pool, Tork watched in shock as Billy was brought down. 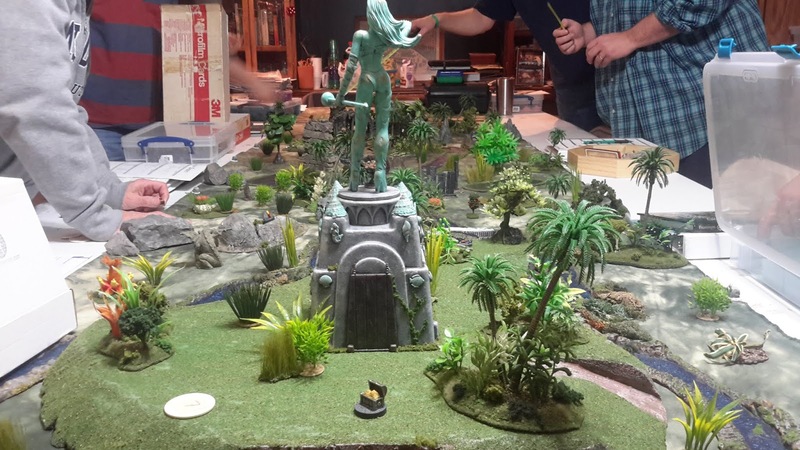 He then noticed the injured Scout, Perkin, climbing down from the obelisk, and attempted to cast Water of Life on him, but was too distracted by the fallen Archer, and what’s more, the strange green woman he could now see standing just on the other side of the brush were Billy had been standing. The Warden puzzled over the strange sight of the green person standing there, and the had the realization that the girl must have been the one to hurt Billy. Meanwhile, Fernando and Habby were dragging the chest safely from the pool. As the two Crewmen worked with the chest, Ginsink trotted by with her load of eggs and said, “See you back at the ship, boys!” as she made her way past them and headed on to the rendezvous point. Not far away, on the high wall, Link dropped his find of the 2-handed axe off the top, and it landed with a thud in the grass. He then climbed down and retrieved it, and joined Ginny, Fernando, and Habby on the path back to the landing boats. Back between the obelisk and the high wall with the effigy on it, Barley and Perkin made their way as best they could to safety; Barley trying to once again (see last months report) maneuver a heavy, sharp, weapon almost twice as tall as she was, and Perkin with his wounded leg. The pair made slow progress, but at last reached the relative safety of the wall. They were well aware that they were still with in easy reach of the Humans and Gnomes. But for the time being, those two factions seemed content with slaughtering each other. Over by the Pool, Tork’s curiosity and anger got the best of him, and he approached the green-skinned Pearl Diver. “Why you hurt him! ?” he demanded, pointing at the fallen Billy. “You bad person!" (I engage to keep her occupied, but being well aware of my starting Warden’s +1 Fight, I declined combat.) For her part, Cassilda’s Pearl Diver was rather threatened by this huge bear of a man coming at her yelling and gesturing; so, quickly she brandished her blade and took a swing at Tork. She missed, and Tork in reflexive response swung the blunt side of his axe at the side of her head. 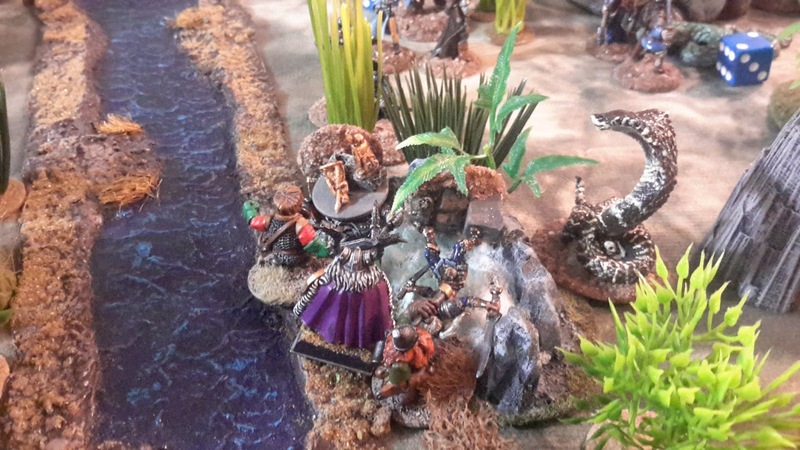 It contacted the girl’s skull like a hammer, and she staggered backwards, her jaw dislocated and her eyebrow gashed and bleeding (I roll a 20, and push her out of combat). Tork said simply, "You go away now.” And with that the Pearl Diver turned tail and ran. The Warden only watched the strange green girl flee for a moment, because there was a sudden stab of pain in his temple. The Wasp was mortally wounded, and the Beast Warden could sense it. 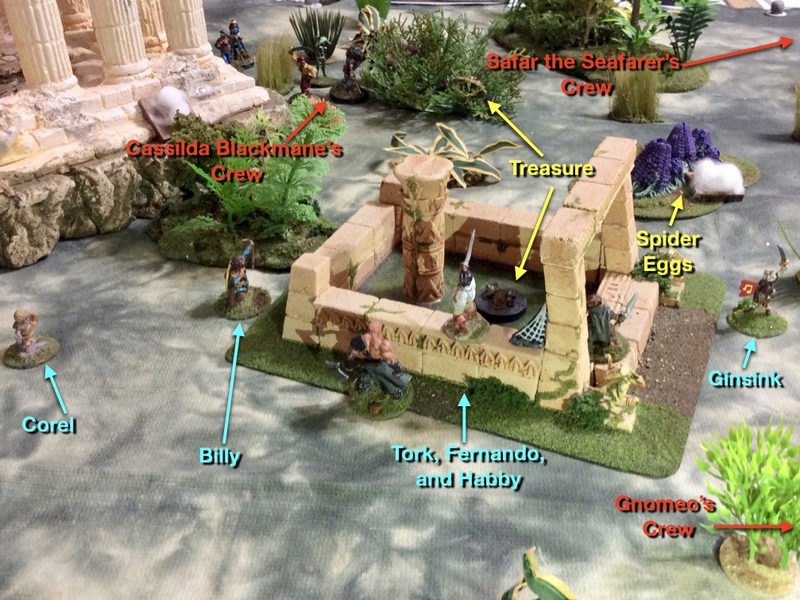 While Tork had been dealing with the Pearl Diver, four of the Gnomes (+8 combat bonus) had encircled the flying beast. With so many targets to keep track of, the huge insect had faltered and fallen to a quick sword attack from behind. Then, suddenly, way back where the crew had first entered the temple area, there came a cry for help from Ginsink the Crew-woman, as she saw a pair of animated Skeleton warriors come into view. The rest of the party looked in Ginny’s direction and those who could, moved to act. Perkin looked at Barley, “Will you be okay?” he asked the Heritor. "Yes.“, she replied, "Go. Help her." And, as the Scout moved off to help the Crew-woman, the Halfling Heritor pressed her back against the wall, and concentrating, felt as her body began to melt into the stone work. (I use Wraithwalk ability.) In a minute she had passed through, and was safely on the other side; out of the reach of enemy missile weapons. The stern face of the idol on the wall looked down at her as if disapproving. …and passes through the wall using Wraithwalk, to avoid any enemy missiles. Like Perkin, Tork ran to help the Crew-woman as well. Ginsink, however, was not one to wait to be saved, or back down from a fight. She dropped her pack of eggs and ran headlong at the nearest Skeleton with her sword held high. With one mighty blow she reduced her foe to a pile of bones. The other skeleton charged at the oncoming Tork, and the Warden also dispatched his opponent with one mighty stroke of his axe. Perkin reached the spot where Ginny had dropped her pack, and picking it up, he signaled to her he had it and then continued on to the landing boats; following behind Fernando and Link who were already well on their way to the boats themselves with their prizes. (Link and Fernando exit table.) Habby, assured that Fernando was well on his way to safety, had turned back to see if he could be any help elsewhere. Crewman Corel faces an 8-legged dilemma. Seeing Crew-woman Ginsink nearby below, Corel called to her, and pointed to the treasure. It would be a lot easier for him to drop the chest off the temple, and for her to come pick it up. Then Corel could safely climb down. Nearby, Tork, watched Corel and Ginny coordinate their efforts, wondering if he could be of any help. But then he noticed a couple dozen yards behind them a regular sized Tree Spider appear from the underbrush. Even though he hated Spiders, the Warden tried to control the beast. He worked at casting his Control Animal spell upon it, but his hesitation was obvious, and though he made contact with the Spider’s mind, the Spider’s Will was too great from him to control its thoughts. (Successfully cast spell, but Spider passed Will roll.) Luckily the Tree Spider wandered off in a different direction of its own accord. In the nick of time, Tork takes Control of the Soldier Crab, as its pincers move within inches of Crew-woman Ginsink. 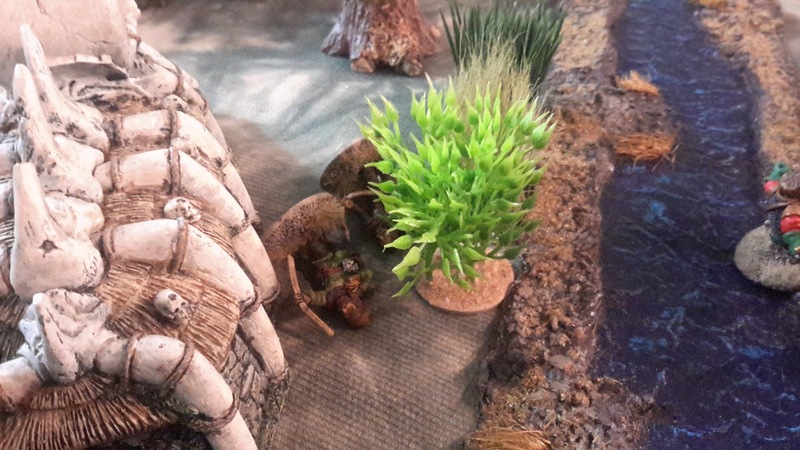 While Tork and Ginny were dealing with the treasure chest and the Soldier Crab, Crewman Habby had been doing a quick scout along the foundation of the temple looking for any ungathered Spider’s Eggs. He saw some hidden up high on the temple’s foundation, behind some brush close to where Billy the Archer still lay near the pool. Climbing up he glanced around to make sure the coast was clear. The Halfling’s eyes almost popped out as over on the far side of the temple floor, he saw a Giant Tree Spider, perhaps a quarter of the size of the Jolly Scallop, battling with a Human. He estimated he had more than enough time to pry the eggs loose from their webbing and make his escape, before the Spider or the Human won the fight, and possibly noticed him. He was wrong. Habby had just managed to free the eggs, and was putting them into his pack, when a shadow passed over him, and the Crewman looked up to see giant fangs dripping on him, and a hairy leg, thicker than he was, lowering to pin him. He dodged, but the big leg still caught him on his side, knocking him back off the temple. He fell backwards into the brush hitting his head on some fallen masonry, and blacked out. Luckily for him, the spider lost sight of him in the bush’s foliage, and moved off towards other prey. Ginny now had secured the chest, and she and Tork made their way towards the rendezvous. But their ordeal was not over yet. 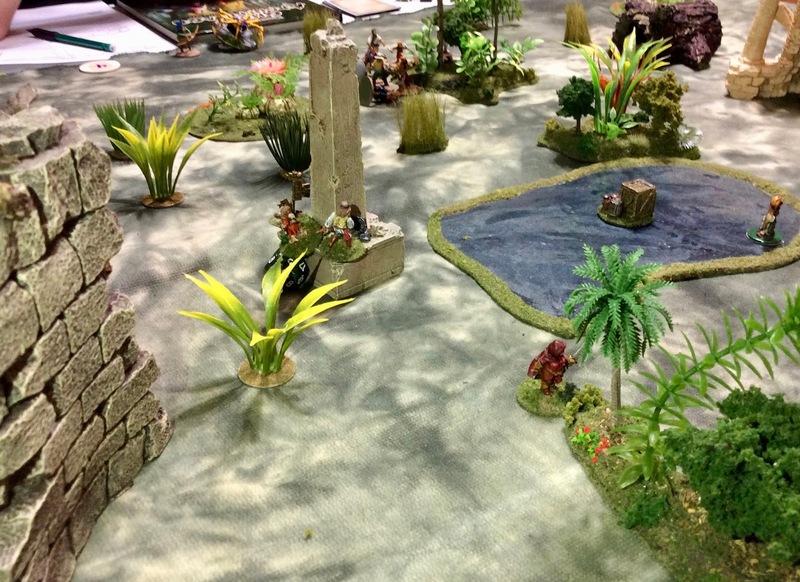 A Gnome Archer had crept through the jungle and brush, until he was just in range of the Halfling Crew-woman. Notching an arrow, he let if fly, and his hit Ginny squarely in the back. She cried out in pain and fell forward, and desperately tried to not pass out, as she crawled with her load towards safety. (1 HP left, and she exited the table). Tork ran up to her, and seeing her wounded state, picked her and her chest of coins up, and rushed with her to the waiting boats. The finally tally and toll. Latter that evening, aboard the Jolly Scallop, Barley and Tork sat in her cabin and looked at the day’s haul. She pondered the oddity of why there seemed to only be two-handed weapons lost in the Archipelago; having found one her last adventure (Superior 2-Handed Weapon +1F), and finding two of them this time: a Magic 2-Handed Sword (+1 F), and a Superior 2-Handed Axe (+1 Dam). As well as the weaponry, Fernando’s chest from the pool had contained about a dozen intricately carved wooden sticks. This had puzzled the Halfling Heritor at first, until Tork had correctly identified them as Divining Rods. They should certainly help them find treasure in the future. The box Corel and Ginny had recovered from atop the temple held 75 Gold Coins! A nice sum, indeed. All in all a good days work. But there had been a cost. Three of the party had fallen in battle that day. And while Habby had only been knocked out and would be Fine; Lily was Badly Wounded from the Goblin Heritor’s Trick Shot, and would be out of action for weeks while she recovered. Likewise, the blow the Archer Billy Wizzit had received to the head from Cassilda Blackmane’s rock, had left him badly concussed (Badly Wounded), and he too would be unable to go ashore for a long time. On the good side though, Billy’s Brother, Jikham, was almost fully recovered from his Bad Wound on their first outing, and would certainly be needed on their next adventure. Barley pondered where that might be, but for right now she was exhausted from the day’s events, and knew bed was where she wanted to travel to at the moment. Tork, too, was yawning in his big chair opposite her desk. The pair said their goodnights, and the big Warden made his way from the Heritor’s cabin and headed up to sleep, as he always did, upon the deck; close to the open sky and the rolling waves where the cry of the seabirds, and song of the whales were his lullaby. Wow, what a game! Four treasures, including one of the Central Treasures recovered! Not sure how long this luck will last, but I am enjoying it while I have it. So far my rush-the- Central-Treasure tactic is working, aided by my 7” move and my Wraithwalk ability. Finding the Divining rods this time, won’t help with the Central Treasure, but will hopefully help with nabbing more regular treasure. I have to say, I think I was also greatly helped this game by the lucky happenstance of the Gnomes taking down the Heritor, Safar the Seafarer, on the first turn. This caused the Human player to want instant revenge on them, and the Gnomes were forced to deal with them. Both got heavily embroiled with each other, leaving my Crew, for the most part, to their own devices. I can’t believe I found two more Magic/Superior 2-Handed Weapons, after finding the one last month! Totally unusable with my Halfling Crew, and the Specialists I picked. Why can’t I find just a plain old magic sword! 🙂 The only bright side is that when I eventually make it back to port, they will be like money in the bank. I’ve been waiting for a Specialist’s death for sailing back to the mainland, but if I find many more unusable magic weapons, I may have to go back simply to cash in my loot. Luckily, we didn’t seem to generate as many Spiders as we expected (Everyone’s post-picking-up-treasure Random Encounter rolls were just too low to generate anything.) But, I will say, the Spiders we did generate were all down the big end of the spectrum, including 2 of the Giant ones. Luckily, none entered directly in my entry zone, and I only encountered few late in the game. 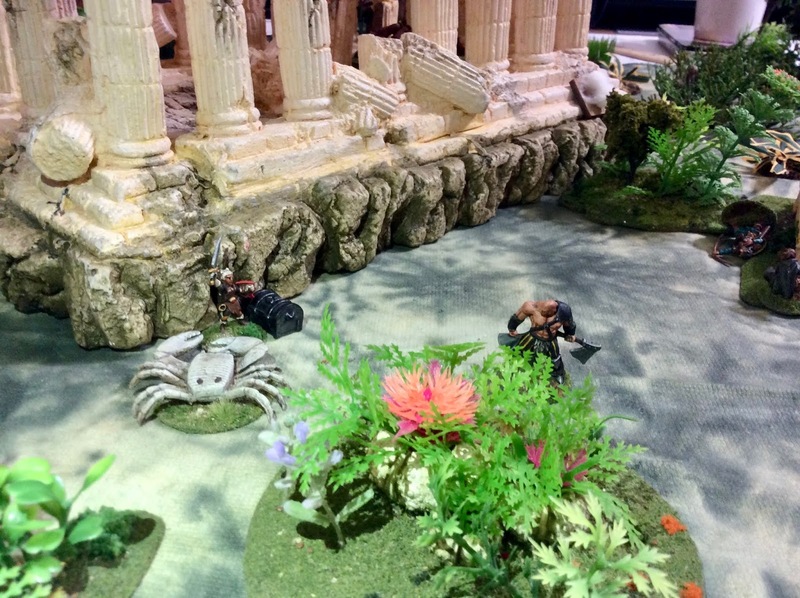 I did however seem to get the regular Random monsters, including the 2 Skeletons, and the Soldier Crab. Having a Beast Warden really pays off in these cases. Another interesting thing about this game was that no Warden ever cast Cloud Cover. It’s the first time in forever that I can remember exploring in full sun. And, as expected we all took archery hits because of it. It was a long hard fought game, going to 9 turns, and once again I kept track of my Initiative Chip draws: T1- 3, T2- 6, T3- 5, T4- 1, T5- 1, T6- 3, T7- 3, T8- 5, T9- 2; for an average Initiative of 3.2 out of 7 possible Chips. Not bad at all compared to last month’s average of 5 out of 8 possible Chips, and nicely below the average draw in general. Hopefully I can keep up this trend in the months ahead. I won’t have to wait long, to test my luck again; as our next game is coming up on March 9th. Ragnam Eichenherz was a self made dwarf, an orphan who had worked hard to parlay his talent into a lucrative business making and selling hardwood charcoal for use by the many smithies in his home town of Vadglim. Vadglim is a bustling dwarven fishing and shipping port – various ores, metal goods, and even ship building abounds. And they all need forges and smelters which consume lots of charcoal. Ragnam looked out across the sea from the top deck of his dwarven ironclad, surveying the small island as they approached. He was making his first excursion into the misty isles in search of his heritage. During the past several weeks, he had encountered others such as himself and learned that he was a Heritor. As such he possessed numerous unlocked latent abilities, some of which he was just beginning to fully explore. Ragnam decided to move forward and signaled his crew. He had detected other crewa stomping around nearby. 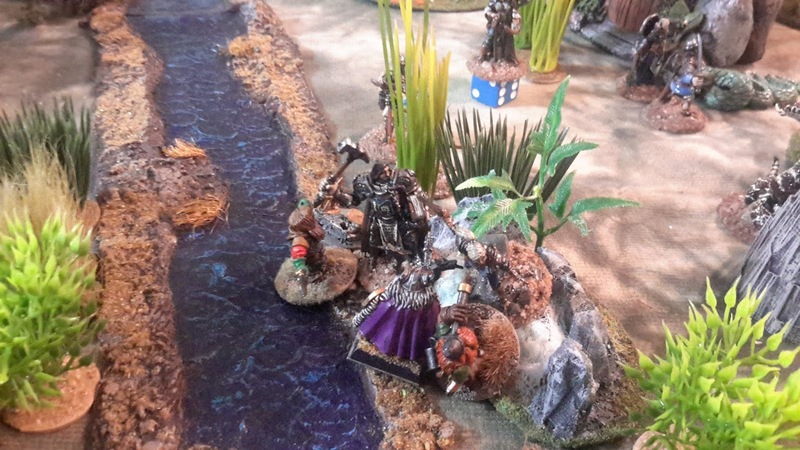 He utilized Wraithwalk to quickly cross a stream and move effortlessly through the underbrush. The burning sensation caused from using an ability still surprised him – would he ever get used to it? As he pondered the thought, Ragnam found himself struck by a crossbow bolt that penetrated his armor (caused 9 damage). “Pay attention” he chided himself as he searched for the source of the attack. He couldn’t spot the crossbowman but he did spot someone wearing shiny black armor moving through the brush. The way he carried himself, he must a fellow Heritor – which meant a fellow opponent. He heard one of his crewmen call him Lord Barl. Bengel (Beast Warden) cast Summon Animal. 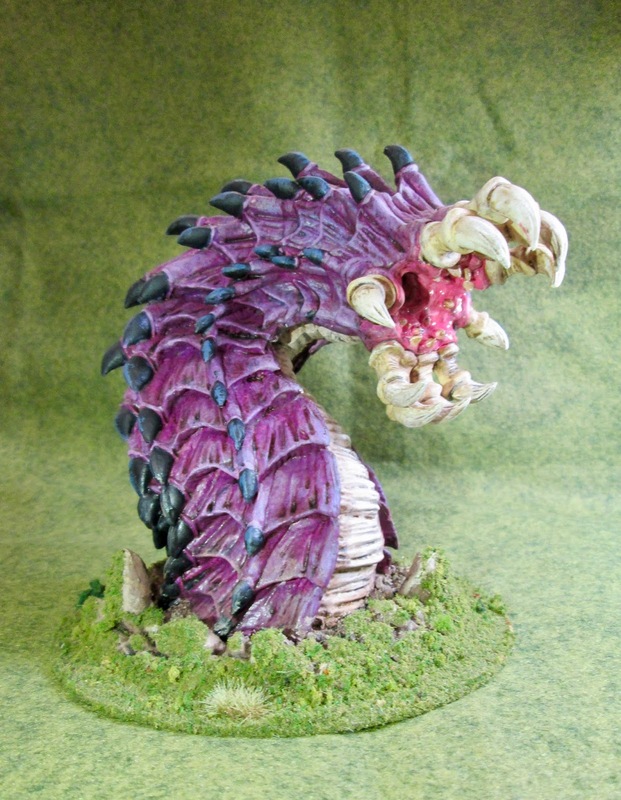 A large snake slithers out of the jungle, heading towards Barl’s crew. He then moved forward to assist Ragnam. As a low mist drifted in (Cloud Cover was cast by one of the nearby wardens), lots of arrows flew through the air without causing any noticeable damage to either crew. 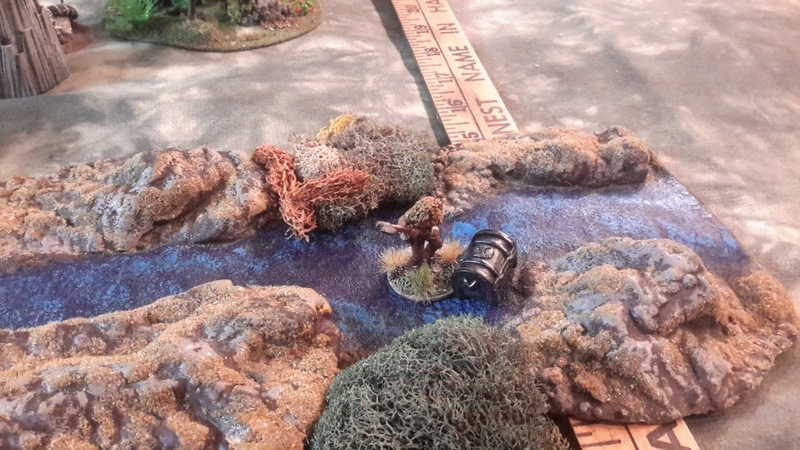 Kippen (Pearl Diver) quickly moved forward to what looked like a treasure chest laying in the middle of a small stream. Kippen dives down and pulls up the box. It looked important so he turned and swam down the stream, heading towards the rendezvous point on the beach. Ragnam watches as Barl reaches down under a small bush and pulls out a small leather satchel (a central treasure). As Ragnam draws his battle axe, Bengel cast Water of Life. 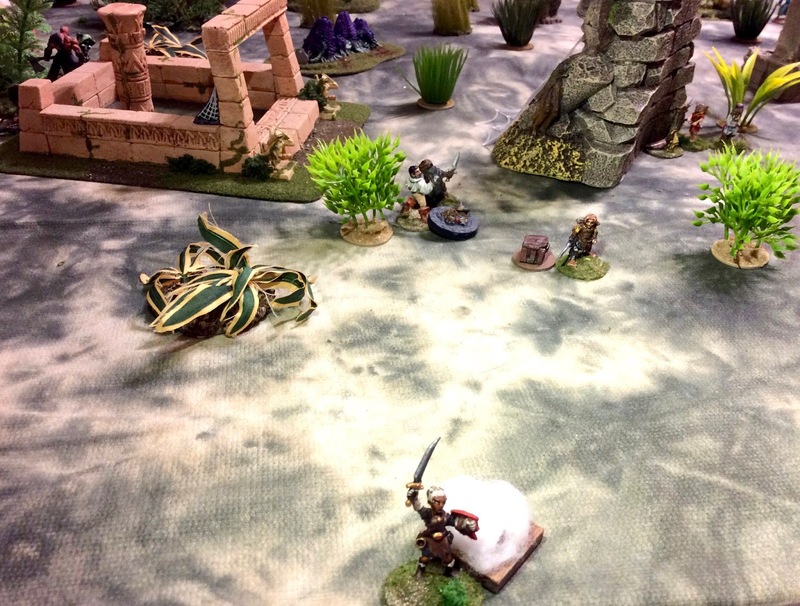 Without giving notice, Ragnam charges out of the brush and engages Barl in melee. His heavy axe was no match for Barl’s feeble little sword. He strikes him hard on the shoulder, the force dropping him to one knee (rolled an 18 +6 modifers, caused 12 actual damage to Barl). Ragnam calls forth his Deathstrike ability (usuable since he rolled an 18) but fails to properly control it. He winces as the burn takes its toll (2 damage due to an unsuccessful ability roll). Barl then makes an attempts to Evade but he fails also (must be a Heritor ability free zone). Once he realizes he can’t escape, Barl counterattacks. 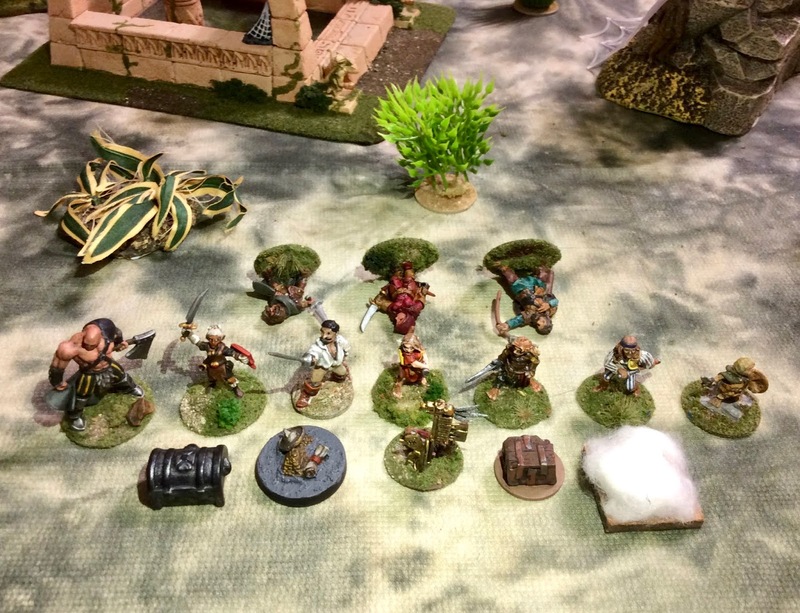 Parry, parry, CHOP ….Ragnam’s axe bites deeply into Barl’s side, dropping him to jungle floor (Barl would later fully recover). The leather satchel slips out of his hands and rolls to Ragnam’s feet. Bengel once more casts Water of Life on Ragnam. 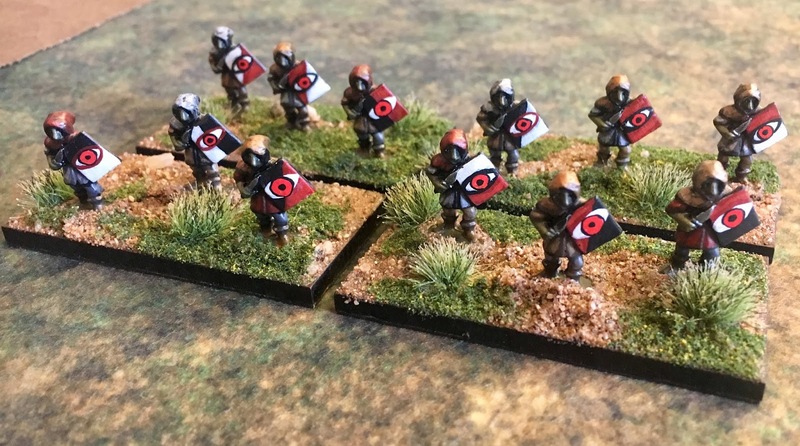 Seeing their Heritor fall, Barl’s archers look for some revenge. Two shots equals two of Ragnam’s archers laying on the ground. One of Barl’s crewmen charges Ragnam. “Such folly” he thinks as he easily dispatches the crewman. And Bengel again casts Water of Life on Ragnam. Ragnam momentarily raises his axe to salute the fallen Heritor Barl. He then reaches down and picks up the satchel. The large snake is pin cushioned by one of Barl’s archers. The next crew member to feel the pointy end of an arrow is Ragnam’s hunter, Liraft. Two arrows hit him and he falls into the vegetation, never to rise again (rolled a 1 for recovery). Meanwhile, Knurrig has spotted something wedged on top of a hut built out of large petrified animal bones. He carefully climbed to the top and grabbed a small elongated box. While he was up there, he saw the two archers fall to Barl’s archers. He quickly hopped down and ran into the jungle underbrush. 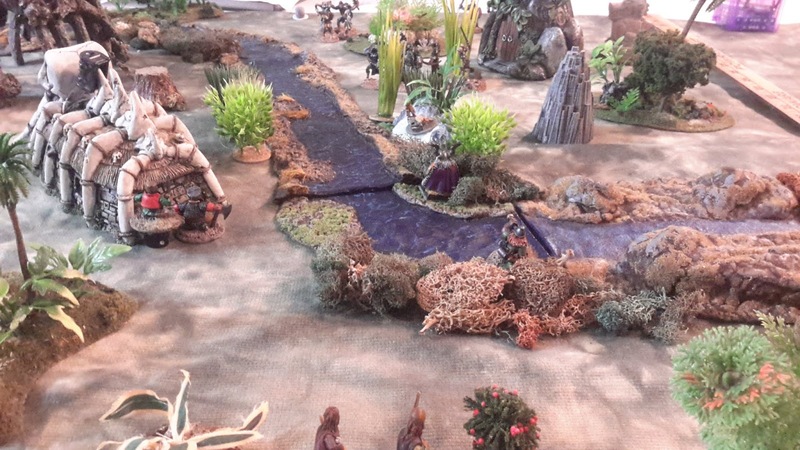 Ragnam calls upon Wraithwalk to quickly cross the stream and move into some heavy brush. The remainder of his crew slowly fall back to cover him. Bengel turns to move back. An arrow whizzes by on his left. A crossbow bolt flashes past on his right. He home free….then another arrow strikes him in the back of his his helm knocking him out cold. Two of the crewmen pause momentarily to pick him up before they continued to move towards the beach. Eventually they faded into the fog and were safe from any further attacks. Once back on board ship, Ragnam takes stock of his crew and the treasure they recovered. Bengel and the two archers will fully recover from their injuries. However, the hunter Liraft did not make it back. The crew raised mugs of ale in memory of their fallen comrade. The leather satchel Ragnam won from Barl contained a pair of finely made shark skin boots (Boots of Swimming). Inside each shoe was 5 gold crowns. Knippen’s chest contained 75 gold crowns, while Knurrig’s box contained 30 gold coins and finely made sword (Hand weapon +1 fight). Not a totally bad result for the first game of the campaign. Hopefully the lost of the hunter (and his bow) will not negatively affect the crew’s performance next game. Hopefully Ragnam will able to make a trip to port after game two and hire a replacement. I am going to run a GASLIGHT game at Cold Wars that is very loosely based on the Tales of the Gold Monkey television show. Each player will have a group of explorers and will set out to find treasure. They will have cards that they can play on each other to slow down the other teams with wild animals, natives, natural disasters, and monsters. The table will be mostly empty except for some jungle. 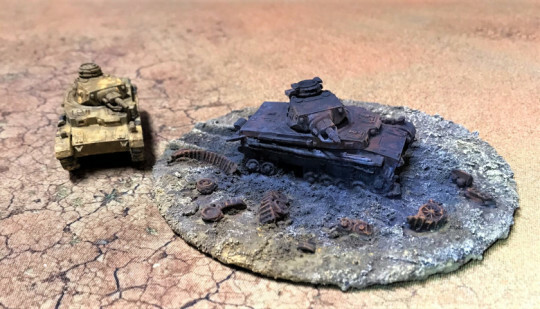 When the players move into terra incognita, I will place different terrain pieces on the table. Team 1: Teddy Roosevelt and some odd explorers. Team 2: Jake Cuter and some Americans. 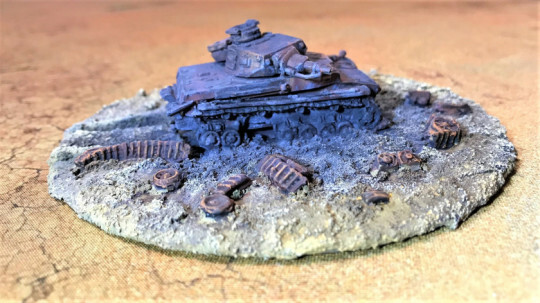 Team 3: The sergeants from Gunga Din and some friends. Team 4: Bing, Bob, Dorothy, and the Andrews Sisters of Mercy. Some native fun that must be stopped. Team 8: French Foreign Legion. Will the players rescue Amelia Earhart? Will the players pry the eyes out of this idol? Or will they ransack this temple? This past week I decided it was finally time to finish up the Goremaw Optional Add-On figure I got with Bones 3. I’ve been messing with the figure for at least a year I think. 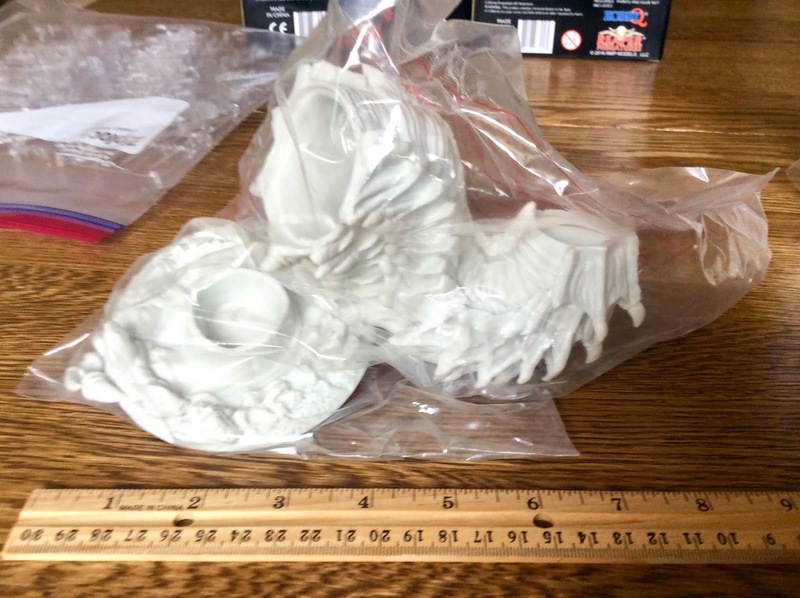 Straight from the Bones 3 Kickstarter shipping box. 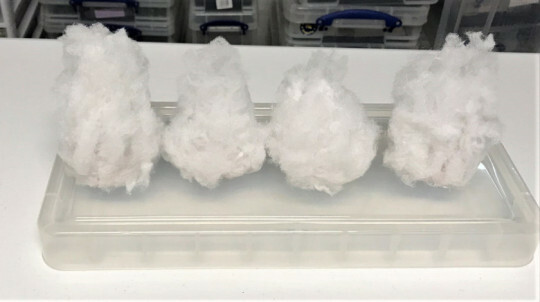 I prepped the figure in the usual way; soaking the parts it in a dish of water with a couple drops of dish-soap added, then giving them a light scrub with a soft toothbrush, and then rinsing and drying them. I then assembled the figure using Gorilla Superglue Gel. After that, I traced the base onto an old CD. I then created a paper mask for the area the base covered on the CD, and taped that on the CD. Next, I sprayed the CD with Flat White primer. 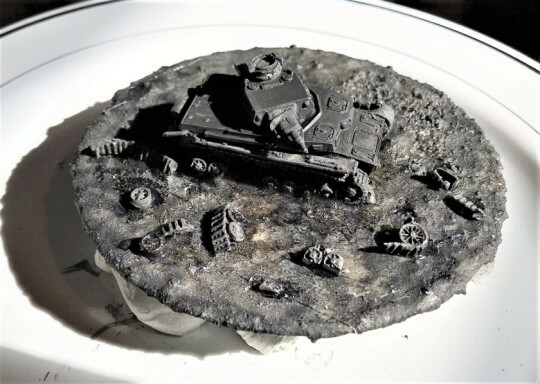 When the primer was dry, I removed the mask, revealing a base sized area that was unpainted; and using hot glue, affixed Gormaw’s base to the un-primed area of the CD. 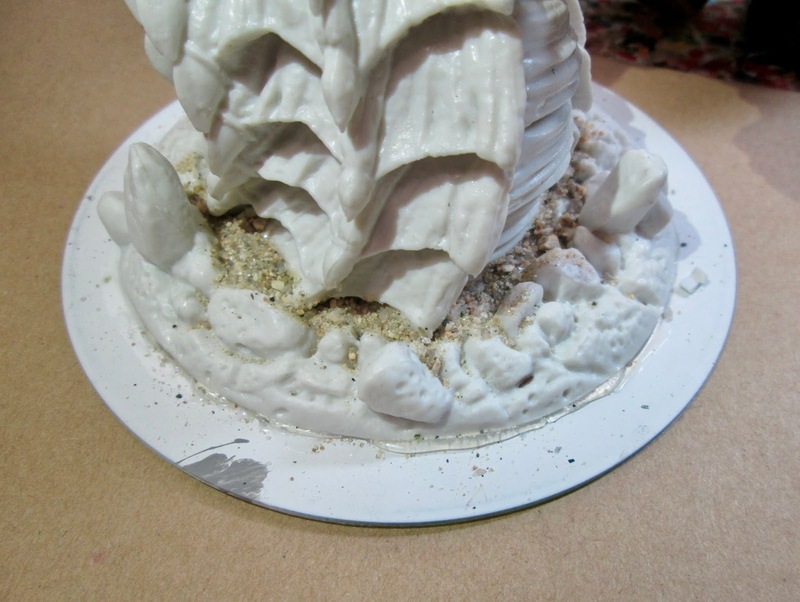 I then used some regular white glue to glue some coarse sand onto the area of the base where the body of Gormaw joins it. 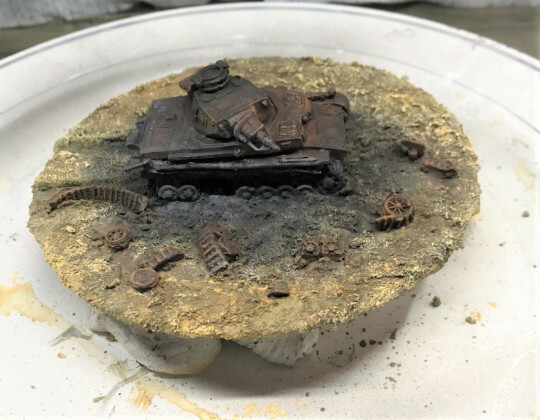 This was to help hide the joint, and to make the area when the body is emerging from the ground look a little more rough and churned. 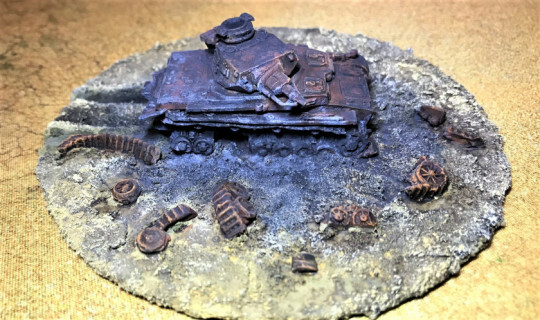 I looked back on my blog, and it was back sometime before July 30, 2018 that I actually applied the first paint to Goremaw, and posted a photo in a “miscellaneous” post here called: Project Avalanche. Anyhow, at that point, I had just applied a first coat of Anita’s “Violet” to the body. I later followed up by painting his underside with Folk Art “Milkshake”. 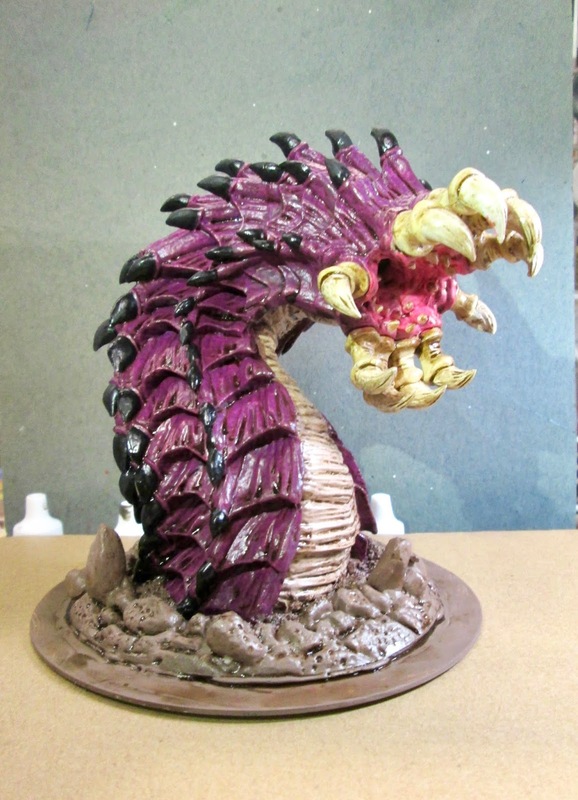 I then mixed a little of the “Violet” and “Milkshake” together and painted the area along the edges where the scales and underside meet to help give a natural blending to where the two colors meet on the body. 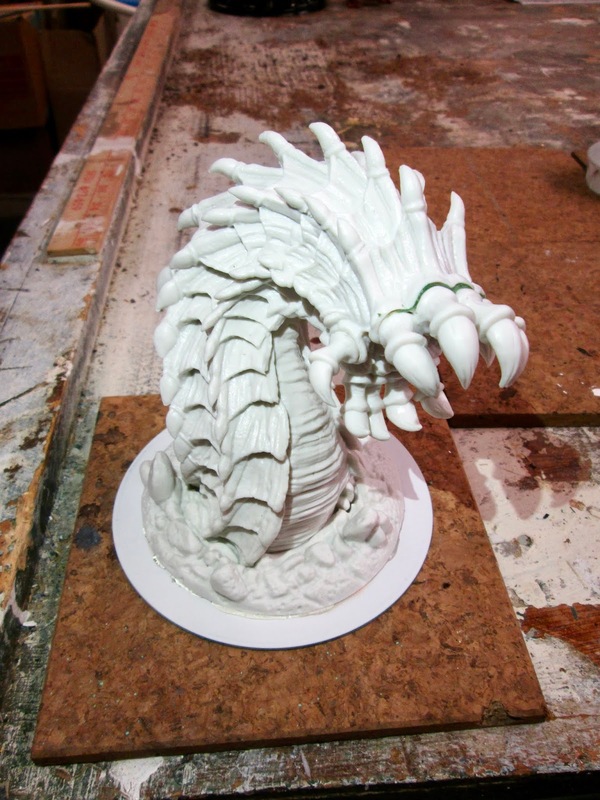 After that, I painted the base of the teeth with Americana “Antique White”. Next, I painted the open mouth with Crafter’s Acrylic “Tutti Frutti”. Here again, I mixed some of the “Violet” and “Tutti Frutti” together to blend the area where the two colors meet on the body, to help make it look more natural. I then painted the teeth themselves with Americana “Bleached Sand”, and the spine hooks on the body with Ceramcoat “Black”. 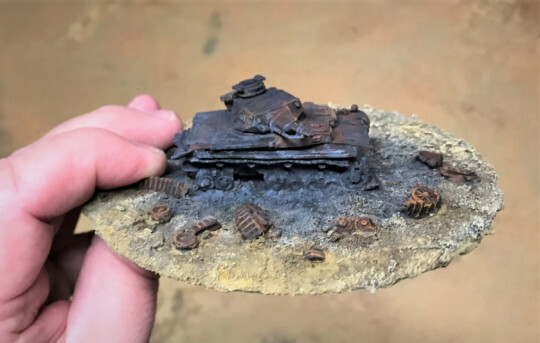 Then, I painted the base with Americana “Mississippi Mud”. 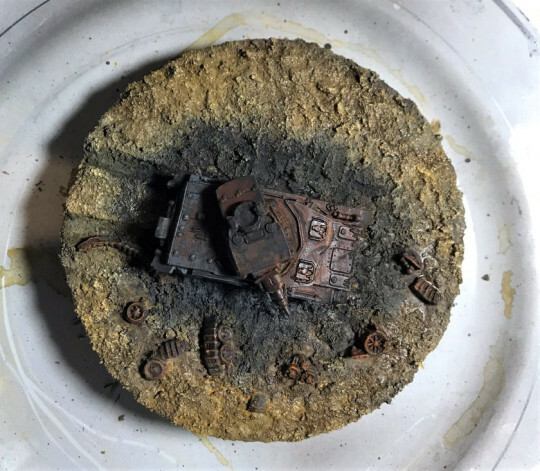 I let everything dry for awhile, and then I went back and applied some Citadel “Reikland Fleshshade” wash to the inside of the mouth. 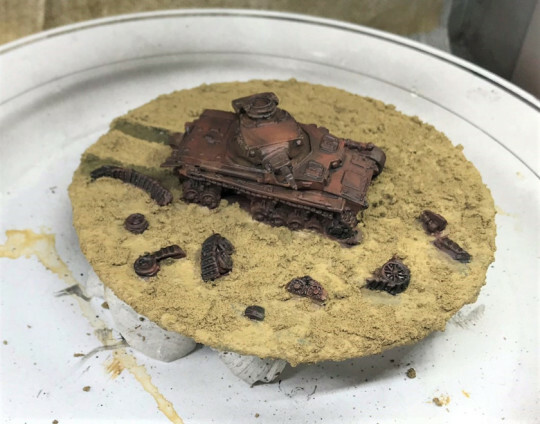 When that was dry, I applied Citadel “Agrax Earthshade” wash to the rest of the body and the base. 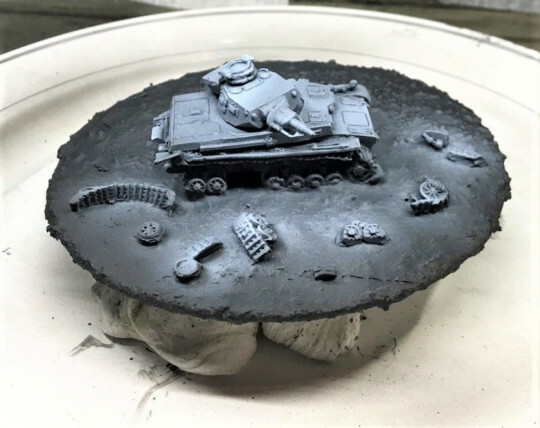 Another drying period, and I came back and applied Citadel ‘Nuln Oil" to the very center of the mouth, and to the undersides of all the body armor plate joints. 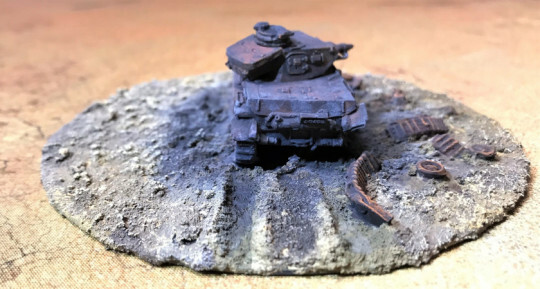 When all the washes were good and dry, I started the highlighting. I began with the body armor plates, drybrushing them with a mix of the base “Violet”, Apple Barrel “Apple Lavender”, and just for the heck of it, some Folk Art Color Shift “Purple Flash” thrown in. Next, I gave the underbelly a drybrushing with the base “Milkshake”; and then a little of the “Milkshake with some Americana "Snow White” added. 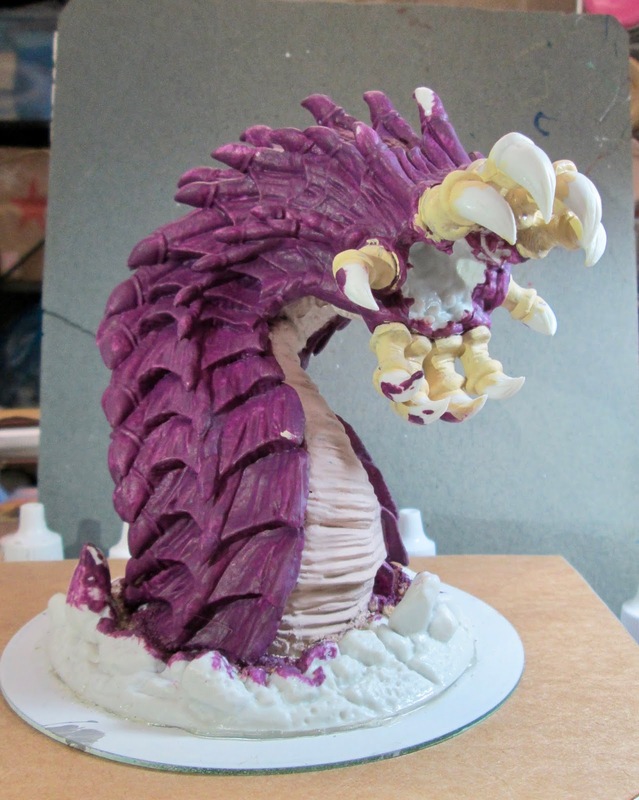 After that, I highlighted the spine hooks with Citadel “The Fang”. 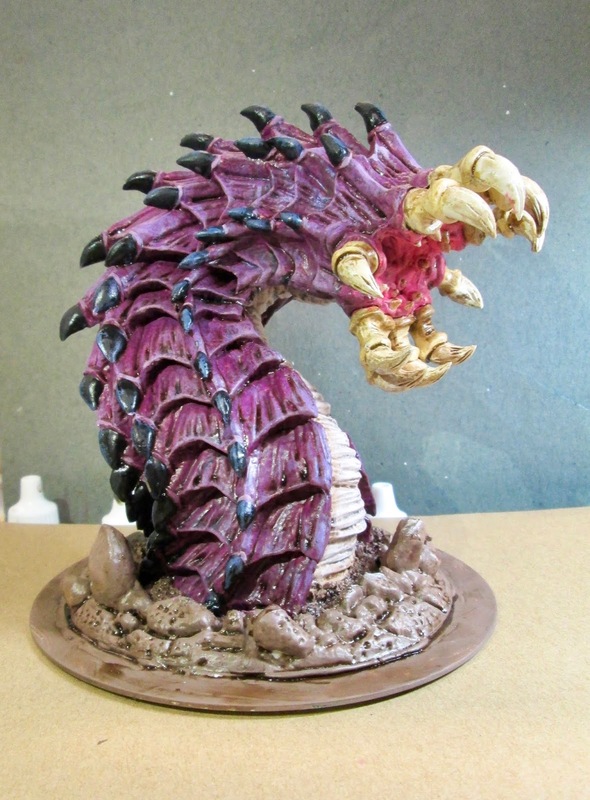 Next, I worked on the mouth; first highlighting the inner maw with a mix of the base “Tutti Frutti”, and some Apple Barrel “Apple Light Pink”. Then I used a little of just the “Apple Light Pink”. I then highlighted the base of the teeth with Americana “Buttermilk”, and the teeth themselves with Crafter’s Acrylic Light Antique White". 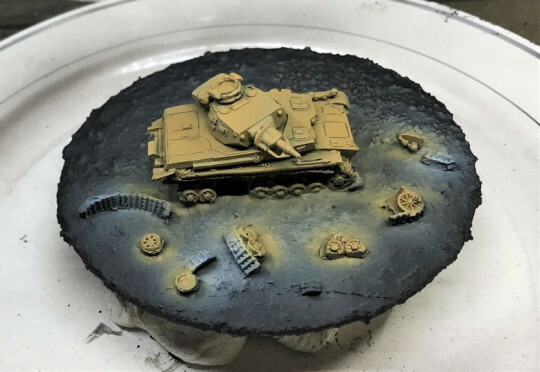 I then turned to the base, drybrushing it first with Ceramcoat “Territorial Beige”, and then with Folk Art “Butter Pecan”. 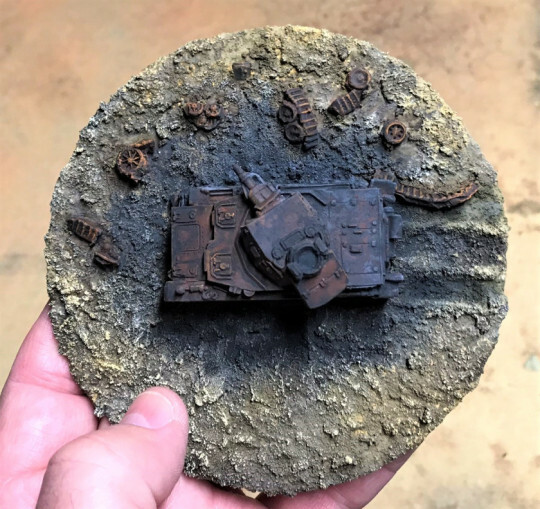 I then gave it a very light drybrush with the “Bleached Sand”. 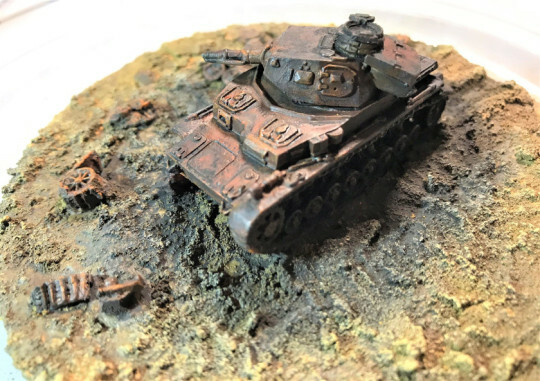 Then, looking at it, I felt the cracks between the chunks of earth did not have enough shadow in them from the “Agrax Earthshade” wash to look like really deep fissures; so I went in and applied Reaper MSP “Brown Liner” directly in all the crevices. I let the figure dry overnight and the next day I gave it a coat of Americana “DuraClear Matte” varnish. 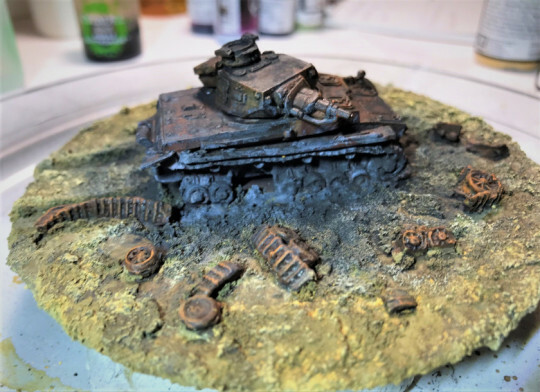 Then, when the varnish was dry, I used some white glue to flock the base, trying just to apply it to the tops of the chunks of ground, and not in any of the fissures. 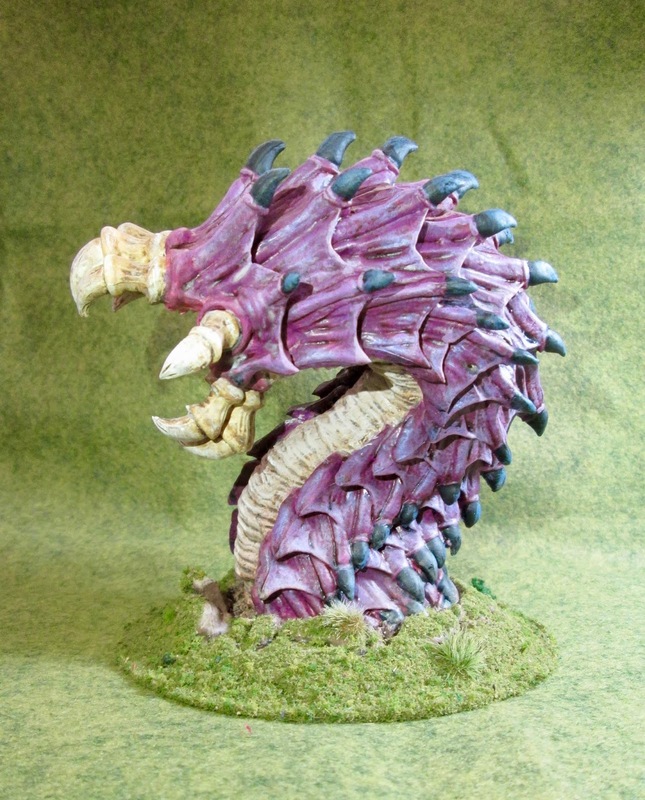 Another overnight dry, and I sprayed the beast with Testor’s Dullcote". When the Dullcote was dry, I repainted the inside of his mouth with Americana “DuraClear Gloss Varnish”. I’m really happy with how this big fellow came out; and I’m glad to have him done before I get more big figures in Bones 4. Often these large figures seem like such a hurdle, but this turned out to be a really easy figure to complete. 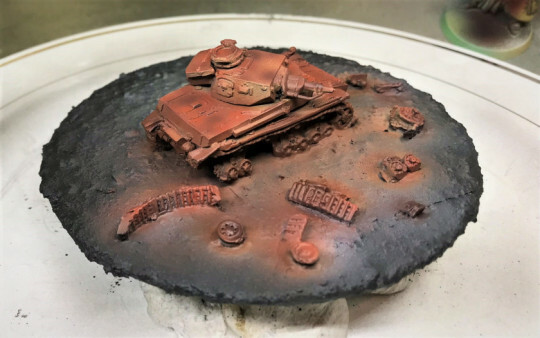 The only challenge was spraying the Dullcote and hitting all the deep crevices in the armor plating. Even now I can see areas where in the deep down recesses it’s still a little shiny. 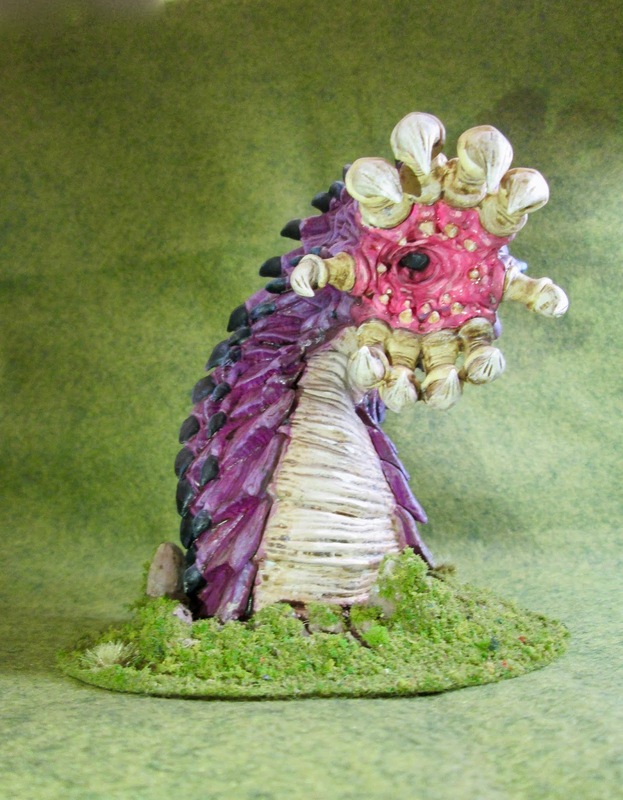 Some years ago, I purchase the dismounted Hydra Miniatures Valkeeri, and I use them as “Venusians” or other suitable aliens for my pulp games. 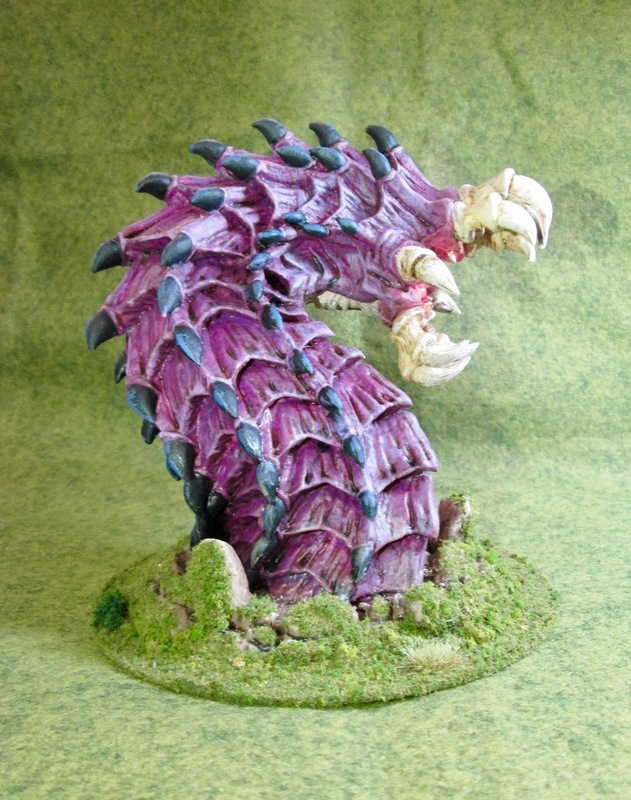 Dismounted Valkeeri from Hydra Miniatures. A few months ago I ordered several of them on rocket sleds. 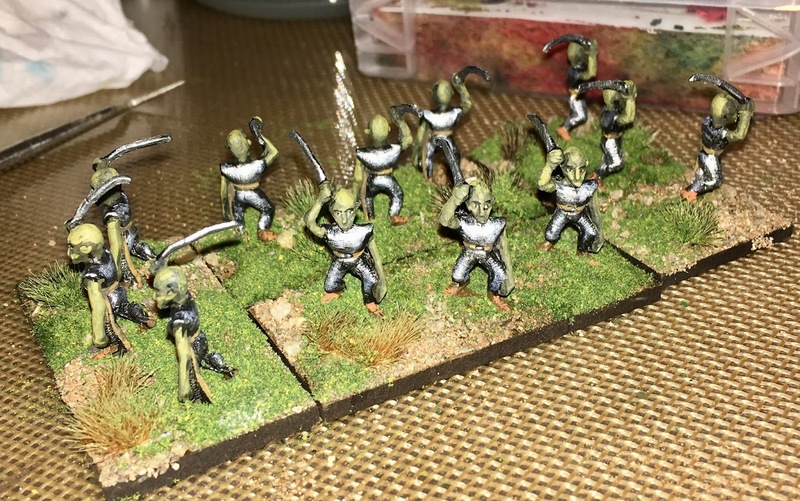 Today I finished painting them. I didn’t get the skin color to match exactly, but they are close enough. 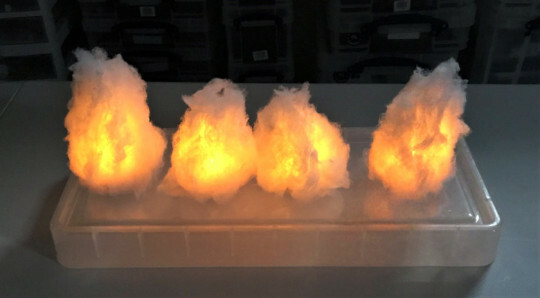 Watch for these in a GASLIGHT game near you. The mission had been a disaster, from beginning to end. Lorria stood in the captain’s cabin of the Grimoire, looking at the figure laid out on the bed – stripped of armor and weapons, a gash opening up his throat. Barl, Chief Acquisitor from the Great Library at Ubar – the captain of the ship, and her employer, a Heritor who had come in search of the Crystal Pool and found only death. A rumor and a reference in an old book had brought them to the Isle of Spiders, where treasure and clues to the Pool’s location might be hidden in a ruined temple. But others had heard the same rumors, or had followed their trail. The spiders had been bad enough, but the dwarves had been worse – followers of a rival Heritor who had attacked them, and slain Barl. “What was the haul today?” she asked. A few of the crew had managed to evade both the spiders and the dwarves, and had made it back to the ship. “Maybe forty ducats in gold? Plus a pair of boots that might be enchanted, and that little chest of herbs.” Hedwig spoke up, her arm in a sling and her face bruised where an axe-blow had smashed her helmet. “Let me take a look.” The boots were definitely enchanted – Lorria could feel the little pulse of power as she ran her fingers over them. A swimming charm, maybe? She flipped up the lid of the herb chest – most of the contents had lost their potency, but that bit of dremlocke weed might still be good. And what was this? Buried at the bottom was a small locket, carved out of wood, almost like a reliquary. Almost of their own accord, her fingers undid the catch. Inside the locket was a small red berry. She could feel a wild laugh welling up inside her. A lingle berry? Rich men back on the mainland would pay hundreds of ducats for one of these, in hopes of the slightest chance of cheating death. With the proceeds, she could pay off the expedition’s debts, have a little stake of her own for if she hired on with another crew… she looked over at the corpse on the bed. Or she could use it now, and try to save poor old Barl. Did she owe him that much? She opened her hand, and there was the ship. “Guess we’ll give this a try.” She picked up the berry, pried Barl’s mouth open, and squeezed the tiny droplet of juice onto his tongue. There was a strange taste in his mouth – like strawberries and vomit and pepper and fire all at once. He opened his eyes, and drew a deep, rasping breath. “Where am I?” he tried to say, but it came out as more of a croak. “You’re back on board the Grimoire.” Lorria’s voice. So, they had made it, then. Memories started to return to him – scuffling with a pair of dwarven toughs, the burning in his blood, the knife at his throat… He reached gingerly up, and felt the ridge of a scar there, as though long healed.